For the regicide of Charles I, see John Hewson (regicide). For the textile artist, see John Hewson (artist). For the basketball player, see Jack Hewson. John Robert Hewson AM (born 28 October 1946) is a former Australian politician who served as leader of the Liberal Party from 1990 to 1994. He led the Coalition to defeat at the 1993 federal election. Hewson was born in Sydney. He has a doctorate in economics from Johns Hopkins University, and also has degrees from the University of Sydney and the University of Regina. Before entering politics, Hewson worked for periods as an economist for the Reserve Bank of Australia, as an economic advisor to the Fraser Government, as a business journalist, and as a director of the Macquarie Bank. In 1987, Hewson was elected to the House of Representatives. He was appointed to the shadow cabinet the following year, serving under John Howard and Andrew Peacock. After Peacock lost the 1990 election, Hewson was elected leader of the Liberal Party in his place, thus becoming Leader of the Opposition. In 1991, he launched the Fightback! policy manifesto, which proposed a series of major economic reforms with a goods and services tax (GST) as its centrepiece. The 1993 federal election focused mainly on economic policy, especially on how Australia should respond to the early 1990s recession. The Labor Party – led by Paul Keating – had been in power for 10 years at that point, and many polls suggested a Coalition victory. However, Labor was able to mount a successful countercampaign, with the party's net increase in seats allowing Keating to remain prime minister. Hewson continued on as Liberal leader for another year, losing a leadership spill to Alexander Downer in 1994. He left parliament the following year, but since then has remained a public figure as a business leader and political commentator. Hewson was born at Baroda Private Hospital in Carlton, Sydney, New South Wales. He was the first of four children born to Eileen Isabella (née Tippett) and Donald Hewson. His mother was born in England and arrived in Australia at the age of six. His father worked as a fitter and turner. Hewson spent his early years in Carlton, where his parents lived with his paternal grandmother and his father's three sisters. His father eventually saved enough money to buy a house in Beverly Hills. Hewson attended Carlton Primary School and Beverly Hills North Primary School before going on to Kogarah High School, leaving in 1963. He subsequently completed a Bachelor of Economics degree at the University of Sydney in 1967. He then gained a master's degree from the Regina, Canada, campus of the University of Saskatchewan (which since 1974 has been the University of Regina) and a second master's and a doctorate in economics from Johns Hopkins University in Baltimore. In 1967 he married Margaret Deaves. Returning to Australia, Hewson worked as an economist for the Reserve Bank of Australia. From 1976 to 1983 he was employed as an economic advisor to two successive Liberal treasurers; Phillip Lynch and John Howard. During this period he developed a keen interest in politics and was determined to enter politics himself. While a strong Liberal, he was internally critical of what he saw as unconvincing and inconsistent economic Liberal Party policies. He was a supporter of some of the economic policies of Margaret Thatcher. After the defeat of the Fraser government at the 1983 election, Hewson went into business journalism and became a director of a private bank, the Macquarie Bank. This allowed the Labor Party to tag him as "a wealthy banker" when he entered politics. Having divorced Margaret Deaves in 1985, in 1988 he remarried to Carolyn Somerville. Hewson was elected at the 1987 election to the House of Representatives for the affluent Sydney electorate of Wentworth. Before his election he was told he would have to give up his Ferrari to get pre-selected. However, Hewson retained his car despite attracting controversy courtesy of it. He entered Parliament at a time when there was a leadership vacuum on the conservative side of politics. The Coalition, led by John Howard, lost the 1987 election and a majority of Liberal MPs voted to keep him as leader over his predecessor Andrew Peacock. In September 1988, Howard appointed Hewson shadow finance minister. In May 1989, when Andrew Peacock replaced Howard as Leader, Hewson became shadow treasurer. Prior to Howard's dumping, when Peacock was the shadow treasurer, Hewson had been seen as the real shadow treasurer. In the lead up to the 1990 election, Hewson, the trained economist, performed well against the then-Treasurer Paul Keating. Hewson claimed in December 1989 that Keating was reluctant to debate with him on the economy. When Peacock was defeated at the 1990 elections, Hewson was elected to the Liberal leadership, despite having been in Parliament only three years. He had been one of the top players in the 1990 election campaign. Hewson defeated Peter Reith 62 votes to 13. Reith was then elected deputy leader, and Hewson made him Shadow Treasurer. Shortly after the leadership change, Hewson made up ground on the Hawke government in the opinion polls, as the Australian economy struggled with the early 1990s recession. Hewson was determined to make a break with what he saw as the "weak pragmatism of past Liberal leaders." In November 1991 the opposition launched the 650-page Fightback! policy document − a radical collection of "dry", economic liberal measures including the introduction of a Goods and Services Tax (GST), various changes to Medicare including the abolition of bulk billing for non-concession holders, the introduction of a nine-month limit on unemployment benefits, various changes to industrial relations including the abolition of awards, a $13 billion personal income tax cut directed at middle and upper income earners, $10 billion in government spending cuts, the abolition of state payroll taxes and the privatisation of a large number of government owned enterprises − representing the start of a very different future direction to the keynesian economic conservatism practiced by previous Liberal/National Coalition governments. The 15 percent GST was the centerpiece of the policy document. While Opposition leader Hewson, apart from supporting right wing economics, also supported abortion, gay rights and working mothers. In December 1991, Keating successfully challenged Hawke and became Prime Minister. Through 1992, Keating mounted a campaign against the Fightback package, and particularly against the GST, which he described as an attack on the working class in that it shifted the tax burden from direct taxation of the wealthy to indirect taxation as a broad-based consumption tax. Keating memorably described the impact of Hewson's GST as "15% on this, 15% on that." Keating famously described Hewson as a "feral abacus." This assault forced Dr Hewson into a partial backdown, agreeing not to levy the GST on food. But this concession opened Hewson to charges of weakness and inconsistency, and also complicated the arithmetic of the whole package, since the weakening of the GST reduced the scope for tax cuts, the most attractive element of the package for middle-class voters. The complications of the new package were famously demonstrated in the "birthday cake interview", in which Hewson was unable to answer a question posed by journalist Mike Willesee about whether or not a birthday cake would cost more or less under a Coalition government. Hewson was instead forced into a series of circumlocutions about whether the cake would be decorated, have ice cream in it and so on, considered by some as a turning point in the election campaign. In reference to the birthday cake interview in an August 2006 interview, Hewson said: "Well I answered the question honestly. The answer's actually right. That doesn't count...I should have told him (Mike Willesee) to get stuffed!". According to Channel 9's 20 to 1 episode Unscripted and Unplanned, the Birthday Cake Interview incident was the moment Hewson lost the election with the interview held 10 days before polling day. However, polls right up to election day supported a Coalition victory. A number of the proposals were later adopted in to law in some form, to a small extent during the Keating Labor government, and to a larger extent during the Howard Liberal government (most famously the GST), while unemployment benefits and bulk billing were re-targeted for a time by the Abbott Liberal government. Keating won a record fifth consecutive Labor term at the 1993 election, with Hewson losing what many had described as "the unloseable election" for the Liberals. The issue of the GST was dropped from the Liberal Party's agenda until the 1998 election campaign. 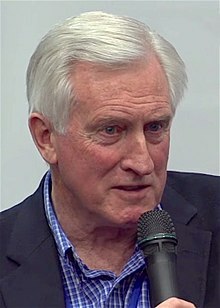 Despite previously having pledged to resign the leadership in the event that he was defeated at the 1993 election, Hewson decided to continue in his position. He defeated a post-election party leadership challenge from John Howard and Bruce Reid after March 1993 however Hewson's leadership position was never secure from that point onward and political colleagues such as Peter Costello, Alexander Downer and Bronwyn Bishop consistently undermined his leadership over the subsequent year. In 1993 Hewson in Parliament declared directly to Paul Keating that the passing of the Mabo act would be a day of shame for Australia, while also trying to find a solution for the Aborigines. In 1994 Hewson declared Fightback! to be dead and buried. In May 1994, he was surprised by a party internal polling on an episode of Lateline. Later that month he attempted to quell leadership speculation in general by calling a leadership ballot for 23 May 1994, but he lost the vote and the leadership to Alexander Downer. Several days later Hewson joined Alexander Downer's shadow ministry as shadow minister for Industry, Commerce, Infrastructure and Customs. During August 1994 Downer dismissed him from the shadow ministry During January 1995, following his controversial joke about domestic violence policy several months prior, Downer resigned as Liberal Leader. John Howard was elected Liberal leader for the second time. In February 1995 Hewson resigned from Parliament, after having one of the shortest careers of any political party leader in Australian politics. He is the only Liberal leader to leave politics without serving as a minister. Future Prime Minister and Hewson's former chief of staff Tony Abbott who had just entered Parliament in the Warringah by-election was among those who voted against Hewson in the May 1994 spill. In the immediate aftermath of the spill, Abbott told The 7.30 Report that Hewson should be remembered for his first three years as leader when he united the party following divisions with the Peacock-Howard rivalry, and not for his last twelve months. Since his departure from politics, he has written extensively for the business and general press, and spent time on the lecture circuit. In his writings he demonstrated an increasing focus on corporate social and environmental responsibility. In 2003-4 he chaired a community advisory committee to RepuTex, a new company that conducts assessments of companies on these criteria, as well as issuing an annual public listing of Australia's top 100 companies on these criteria. In 1995, Hewson was invited to join IT&T Services as a non executive director in one of his few private enterprise successes. IT&T was a specialist IT and telecommunications design and project management group who delivered major technology projects for both corporate and government clients such as Citigroup, Department of Defence, News Limited and Ernst & Young across the Asia Pacific region. IT&T Services was acquired by public company Powerlan Ltd in 2000. He became Professor of Management at Macquarie University, Sydney, and Dean of the Macquarie Graduate School of Management in 2002 but resigned within two years. While at Macquarie University, he also served as a consultant to ABN AMRO. In 2005, Hewson was elected onto the Touring Car Entrants Group of Australia (TEGA) board as an independent member. He left in June 2006 after a dispute with V8 Supercars Australia Chairman Tony Cochrane. John Hewson held the position of chairman of the board of directors for the Elderslie Group, a company whose primary interests lie in the areas of corporate finance and property investments. Hewson touted investors in the group to increase their investment at a time when Elderslie was in difficulties but left them to face liquidation and big losses on their own when he resigned saying that he was unsatisfied with the direction the Group was heading in. On 2 July 2008, global accounting firm, PWC was appointed as receiver and administrator of the failed Elderslie Group. Since circa 2005, Hewson has been a member of the Trilateral Commission, an alliance of top political and economic leaders from North America, Asia-Pacific, and Europe. He is Chairman of General Security Australia Insurance Brokers Pty Ltd. In December 2012, Hewson was appointed as a non-executive director of Larus Energy, an oil and gas company developing operations in Papua New Guinea. After 1996 Hewson became increasingly critical of Prime Minister John Howard. In 2003 he opposed Howard's decision to take part in the Iraq War although in 2004 argued it would be electoral "suicide" for the Liberal Party to replace Howard with an alternate leader at the time. In July 2006, Hewson gave an interview to ABC's Four Corners program in which he voiced concern at the growing influence of what he characterised as a "hardline right religious element" in the NSW branch of the Liberal Party. This was in breach of a Liberal Party rule about speaking to the media and reports at the time claimed he could face expulsion from the party. Hewson has repeatedly appeared in television interviews and on political panels and has been a regular columnist for the Australian Financial Review since 2004. In 2011, he and former Liberal prime minister Malcolm Fraser were among 140 Australian community leaders who pledged support for an emissions trading scheme, despite the fact the Coalition and its leader Tony Abbott (Hewson's former Press Secretary) oppose the Carbon tax. In 2000, Hewson was honoured as a Member of the Order of Australia. Hewson married Margaret Deaves in 1967. Having divorced Deaves in 1985, in 1988 he married Carolyn Somerville, described by news media as "a formidable figure in investment banking". They divorced in 2004. In 2007, John Hewson married publicist Jessica Wilson. As of 2010[update] they reside in the Southern Highlands of New South Wales. He has six children. Since leaving politics, Hewson has been involved in a range of non-profit organisations, including the Arthritis Foundation of Australia and KidsXpress, a charity providing expressive therapy for children. ^ Christine Wallace (1993). Hewson: A Portrait. Pan Macmillan Publishers Australia. p. 3. ^ Wallace (1993), p. 4. ^ Wallace (1993), p. 5. ^ Wallace (1993), p. 12. ^ a b c d e Wilmoth, P (10 April 2004). "The man we knew as Hewson". The Sun-Herald. Fairfax Media. Retrieved 28 August 2010. ^ Gordon, Michael (22 October 1989). "Overnight sensation". The Sunday Age. Melbourne. ^ Millington, Bob (3 March 1989). "Political shadow boxing". The Age. Melbourne. p. 2. Retrieved 7 December 2014. ^ Weiniger, Peter (5 December 1989). "A shadow treasurer clocks up points". The Age. Melbourne. p. 5. Retrieved 7 December 2014. ^ "John Howard. People of the Liberal Party of Australia". Liberals.Net. Australian Media Pty Ltd. Retrieved 13 July 2013. ^ Tiernan, Laura (5 December 2005). "The rise of the religious right in Australia - World Socialist Web Site". www.wsws.org. International Committee of the Fourth International. Retrieved 6 February 2017. ^ "Opposition leaders' fates over 30 years". The Daily Telegraph. News Limited. 1 December 2009. Retrieved 28 August 2010. ^ "John Hewson". Enough Rope with Andrew Denton. Australian Broadcasting Corporation. 7 August 2006. Retrieved 28 August 2010. ^ The article "Hot Pies, Cold Pies AND Pie-Eaters", by Alan Ramsey, Sydney Morning Herald, 6 March 1993 places the interview the "previous" Wednesday evening on the Nine Network's A Current Affair, which would make it 3 March 1993, 10 days before the election. ^ "Newspoll records". Newspoll. 31 May 2008. Retrieved 28 August 2010. ^ a b c Hewett, Jennifer (31 March 2010). "In constant motion". The Australian. News Limited. Retrieved 28 August 2010. ^ a b "Out of the rough: Kennett and Kroger end feud". theage.com.au. Retrieved 13 July 2013. ^ Jackson, Liz. "Judgement Day - Four Corners". Abc.net.au. Retrieved 13 July 2013. ^ Moreton, Romaine (2 March 1996). "After Mabo (1997) clip 2 on ASO - Australia's audio and visual heritage online". Aso.gov.au. Retrieved 13 July 2013. ^ "Paul Keating - A Chronology". AustralianPolitics.com. Retrieved 13 July 2013. ^ "Biography for HEWSON, Dr John Robert". Parlinfo.aph.gov.au. 31 August 2009. Retrieved 13 July 2013. ^ Name: * (31 August 1994). "Loose cannons". Greenleft.org.au. Retrieved 13 July 2013. ^ Banham, Cynthia (18 December 2004). "Downer's mark". Sydney Morning Herald. Retrieved 27 January 2018. ^ "Digging for gold in the marginals - Alan Ramsey". www.smh.com.au. Retrieved 13 July 2013. ^ Mayne, Stephen (12 February 2009). "Do former Coalition ministers perform well on boards?". The Mayne Report. Retrieved 3 April 2013. ^ Hall, Eleanor (30 August 2004). "Day one of the election race: who do we trust?". The World Today. Australian Broadcasting Corporation. ^ Klan, Anthony (3 July 2008). "Elderslie Finance Corporation in receivership after John Hewson bid fails". The Australian. News Limited. Retrieved 29 March 2010. ^ "Membership list" (PDF). Trilateral Commission: List of Members. Trilateral Commission. August 2010. Retrieved 28 August 2010. ^ "Dr John Hewson – Chairman". About GSA. General Security Australia Insurance Brokers Pty Ltd. 2010. Archived from the original on 18 February 2011. Retrieved 28 August 2010. ^ "Hewson to join board of PNG miner Larus". news.com.au. News Limited. 12 December 2012. Retrieved 14 December 2012. ^ Cohen, Janine (17 July 2006). "Interview: Dr John Hewson". Australian Broadcasting Corporation. ^ Davies, Anne (24 July 2006). "Membership must have rewards – or parties will die". The Sydney Morning Herald. Fairfax Media. Retrieved 6 August 2010. ^ Johnston, Matt (31 May 2011). "John Hewson breaks ranks on climate stance". Herald Sun. Retrieved 28 May 2012. ^ "HEWSON, John Robert". It's an Honour. Department of the Prime Minister and Cabinet (Australia). Retrieved 29 June 2016.